Making My Tennant Coat: I gotta stop doing this to myself! The busiest week of last year was in late June, when I went to the Bonhams Auction on the 23rd; a Tour Of Cardiff on the 24th; a Tour Of London on the 26th (clashing with the broadcast of The Big Bang); and reviewing the Cloth Ears Six Coat on the 27th. Well, this week has been the 2011 version – and it’s only February!!! It all started off on Monday with a sort of downer, as I finally had to ship out the Tennant Suit I had made for Kevin Coppa so he had it in time for Gallifrey. Tuesday was - well I’ll come back to that later, but the evening was fun. 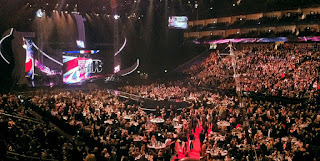 I had the offer of free tickets to the Brit Awards at The O2 (see right). 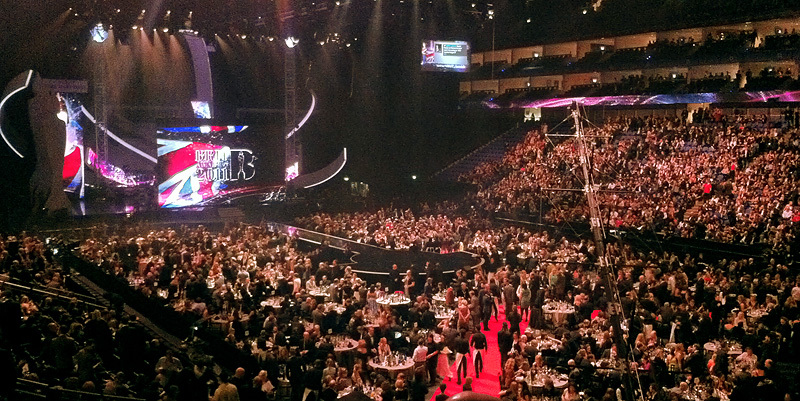 It was hosted by The Lodger star James Corden. 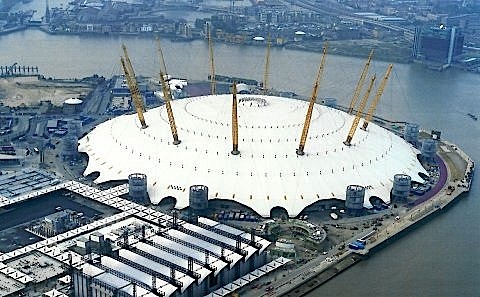 For those that don’t know, The O2 was built in 1999 as The Millennium Dome and formed the centrepiece of the UK’s year-2000 celebrations. It has since been turned into a concert venue. It featured in the pre-credit scene for the Bond film, The World Is Not Enough. Thursday was the official opening of the Doctor Who Experience exhibition at Olympia, near Earls Court (ironically where the Brits were held for many years, until this). I had pre-booked tickets for the first entry on the first day, paying a bit extra for a premium package. You can read about that under Doctor Who Experience Preview. Well this was’t planned - well not prior to Tuesday at any rate, but after waving the suit off on it’s journey to the US, I was just compelled to follow it and see how it all went at Gallifrey. So on Tuesday I had gotten myself a Visa Wavier, return flights, and a room at the LAX Airport Marriott Hotel, so today I flew out, landing at 2pm. I cleared customs by 3.30pm and went straight to the hotel, checked in and dropped off my bags to then change into my Ten outfit. I was then ready to track down that suit! I found Kevin in the cosplay room, giving him the shock/surprise of his life – he never expected me to show up! Come to that – I never expect me to show up!!! I hope you got a bunch of photos for another post! Saw a picture of you on Facebook !!!! From Gallifrey 22 in the US ! i remember well the time when i stepped into the cosplay room to see what was going on there, and saw you at the front table. We looked at each other for a good... 3 seconds, with me thinking: how come he is here? It was very nice meeting you face to face. hopefully, our paths will cross again at some point.